Electronic waste, or E-waste includes televisions, computers, and other electronic appliances that can contain hazardous components that can affect our environment and health if these items are sent to landfill. That's why we don't accept these items in our household clean-up service. All residents and small business owners can drop off their e-waste at one of our e-waste drop off events (see locations below). This way, the e-waste is disposed of safely, and nearly all of the e-waste is recycled into new materials. 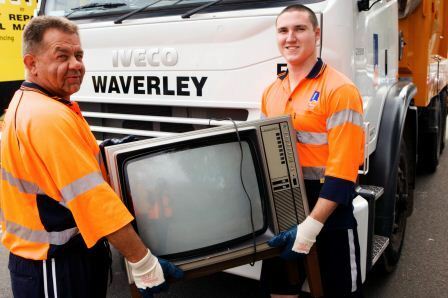 Council runs FREE local e-waste drop off events twice per year where your e-waste is recycled rather than going to landfill. Council typically collects around 50 tonnes of e-waste each year at these events. You can bring your e-waste to us and we'll make sure it is recycled safely and responsibly. You don't even need to get out of the car; our friendly staff will do the lifting for you. Please note, we cannot accept white goods, fluorescent tubes / light globes, oil heaters or smoke detectors. We have two FREE E-waste Drop-off events each year. Where: Alexandria Integrated Facility at 67a Bourke Rd, Alexandria. Check out the What's On calendar to find out the next drop-off event. Click on the links below for more information on recycling e-waste.